Strange things crawl out of the Irshick Lab. A few years ago, biologist Duncan Irshick helped create Geckskin, a super-adhesive that mimics the mechanics of gecko feet. In January, he developed the Beastcam, a portable camera array that can snap high-resolution, full-color 3D images of living organisms. Now, the University of Massachusetts Amherst researcher is leading one of the most ambitious imaging initiatives around — 3D modeling every living species on Earth and publishing the data through Digital Life. “In the field, people often have to kill an animal to preserve it,” Irshick tells Digital Trends. “With our 3D models, the animal can stay alive. The Beastcam array consists of 30 cameras, three on each of its 10 arms. The device takes 30 simultaneous snapshots and uses software to stitch them all together into a 3D representation. “The current system is designed for smaller animals who pose really well for photographs,” Irshick says, listing frogs and geckos as particularly good subjects. “So the current range is from about three-and-a-half inches to 10 inches, but in the next several months we’ll have the capacity to capture animals from half an inch to six feet or more. 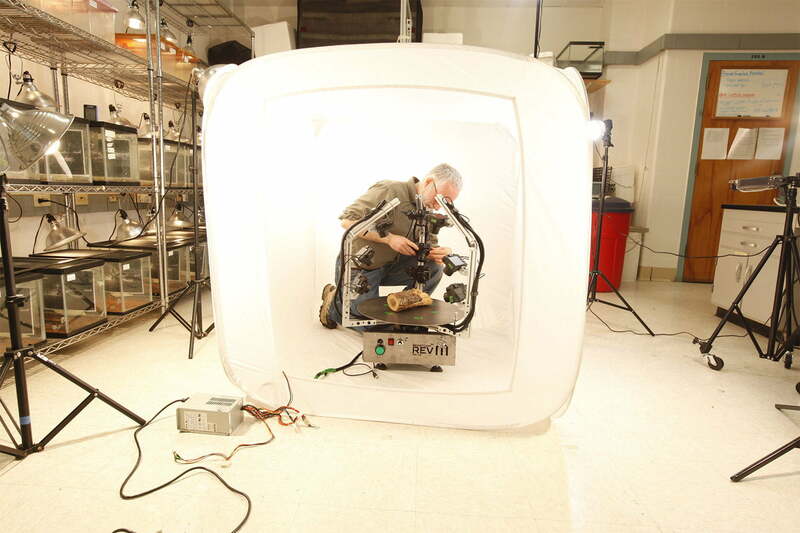 When imaging larger creatures like sharks in more precarious environments outside the lab, Irshick and his team turn to a handheld Beastcam, which they sweep around the specimen manually. Nine 3D models are available on the Digital Life website, including an emperor scorpion, horned frog, and birch fungus. “As far as I’m aware, ours is the only high-resolution 3D shark model,” Irshick says. Each can now be viewed in virtual reality, with dozens more models and exportable 3D printing files on the way. Over the next year, Irshick thinks they’ll have captured images of hundreds of species. But each species is unique and every specimen has its quirks. One size won’t fit all. “Some sharks are really fat,” Irshick says, “and others are really skinny. We want to capture that.” By developing versatile Beastcams, the researchers hope to tailor their technology to the particular species and specimens they’re imaging. The initiative insists on ethical handling of animals, so it aims to image live specimens only when they’re already being handled for parallel scientific study, which Shepard says sets the project apart from others. These models also have significant scientific value, she says, as highly-accurate depictions of living creatures are rare. Along with the models, the researchers will record metadata on measurements, locations, and species information, which can be accessed for further research. And these models may help wildlife conservation groups engage the public in novel ways, with 3D printed objects and virtual reality to spark the interest of potential donors. Over the next year, Irshick and his team will be traveling around the world thanks to support from the National Science Foundation. From the Philippines in May to Florida in June, they’ll partner with field researchers to image endangered species of toads and sea turtles before moving on to more complicated creatures. Along the way they’ll continue to test and adapt their imaging techniques for their future subjects. It may take generations to image the nearly trillion species thought to exist on Earth, but every species that’s captured is a species that’s digitally preserved.